« it’s a new poster! even though over here at SPIT headquarters it has seemed like a few weeks of silence, we have been working hard at bringing you an even WILD AND CRAZY night of mayhem over at our fave little yellow house on ontario ‘n eighth. Dusty Volumes is a librarian & lady in training. 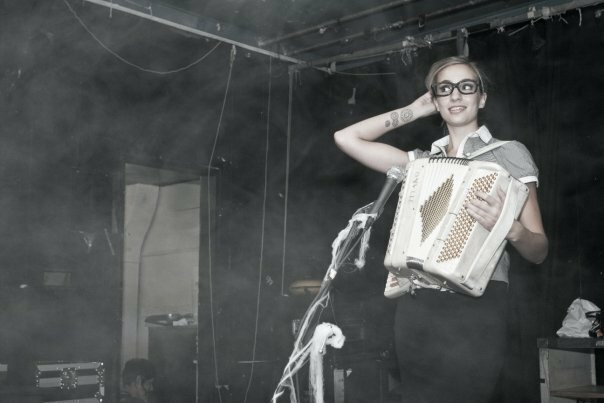 She may look graceful and demure but she unleashes waves of crass & sass from her accordion while shaking her tatas. On her days off from the library, this amazon can be found on her bike (toning her bum!) with a bottle of scotch in her basket. basket, indeed. even though we quickly figured out last time that you good folks love your G&T, we’ll make sure that there’s plenty of good ol’ whisky for you to nuzzle up to darling Dusty and ask her to serenade you in private. don’t be fooled by the mainstream. you KNOW where you’re going to be on friday night. in other news, be prepared for some hot pole-dancing action from 9:30 onward…as well as a few surprise performances that will leave you spellbound. of course, they’re secrets. so we’re not telling what they are. you’ll just have to come and see. This entry was posted on February 1, 2010 at 15:12	and is filed under Uncategorized. You can follow any responses to this entry through the RSS 2.0 feed. Both comments and pings are currently closed.